Companies across the U.S. are looking for an effective WiFi panic button for their facility due to the increase in workplace violence incidents. Workplace violence has become a vast concern, leaving business owners assessing ways to actively respond to the ever-growing epidemic. Meanwhile, security management teams are tasked with searching for various safety products to try and stay above the violence. Finding solutions to security concerns is imperative because all industries have some level of threat present. Most companies operate within strict safety budget constraints. More often than not, the high cost of installing security devices drops in importance due to funding issues. Therefore, security initiatives are often put on the back burner. CRS Notify is an effective and affordable safety tool for any size business. Our WiFi panic button software can help businesses be proactive against workplace violence without breaking the company budget. Read further to find out more about WiFi panic buttons. What is the Difference Between a Traditional and Technology Driven WiFi Panic Button? There is a significant problem with the traditional panic button device. This type of 911 panic button is a blanket product that usually requires a technician to install which can interrupt daily office activities. For instance, many conventional 911 alert devices are offered through local alarm companies. The alarm company hard-wires the panic devices through your phone system to be able to send out alerts. The problem with that is, you do not know how long it takes to contact responders or if the panic device contacted anyone at all. Knowing that you are receiving the help you need when it is called upon is a sense of security every industry deserves. CRS decided to test several old-fashioned panic systems a few years ago and we are still waiting for the confirmation to go through that the alert was received. The old school 911 alert device defaulted, and no one knew. Imagine a situation where you believed help is coming but they never came? What is next? What is your backup plan? A Software-driven WiFi panic button offers security initiatives in a panic button for your company that is technology based. There are systems in today’s market that integrate internal and external notification alerts to multiple people, using various channels ALL at the push of a button. You also get the benefit of numerous alert levels instead of just the one alert level offered by traditional panic systems. Furthermore, modern notification systems are easier to manage. You can usually make changes from one centralized point without contacting your local alarm company for assistance. How do you know a Computer-Based WiFi Panic Button is a Right Choice for Your Facility? Nurse’s stations, HR offices, and receptionist’s desks are some of the many places where workplace violence occurs. Any employee, no matter their position in the company, can become a victim of violence. A WiFi panic button from CRS Notify can offer these employees a better sense of security. The WiFi panic button can allow them to call for help quickly and discreetly without drawing attention and putting themselves in danger. Moreover, computer-based WiFi panic button makes it easier to contact the authorities when a traditional 911 phone call may not be possible. 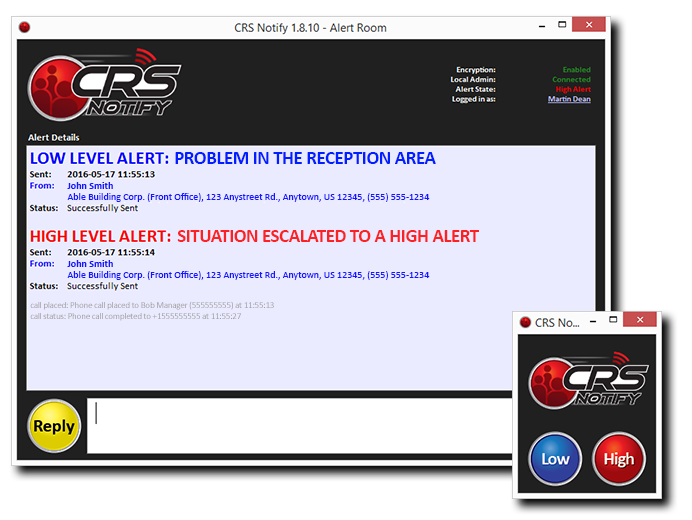 WiFi panic buttons from CRS Notify send out mass notifications to employees and respondents. This rapid alert cuts warning times down to seconds instead of minutes. Furthermore, this type of notification strengthens the response time of respondents and allows employees the time to react efficiently to any crisis. Once authorities respond to the alert, there is a greater chance of catching the assailant. Through multiple communication channels, crisis information is directed to staff members. Having this valuable information in a timely fashion can save lives and help everyone remain calm. A WiFi panic button from CRS Notify helps to protect employees from life-threatening incidents. Moreover, the rapid notification gives authorities needed information to respond to the crisis. With the click of your computer mouse or push of a button on a hardware device, you would be able to send an alert without alerting the criminal. In conclusion, a dedicated WiFi panic button on your network adds a valuable layer of security. 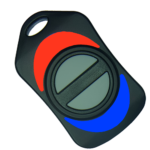 A WiFi panic button system quickly and silently asks for aid and offer employees a better sense of security WiFi panic buttons are a solution you can count on in a crisis. Still Unsure About a WiFi panic button? Contact us for more information to make the best decision for your WiFi panic button.